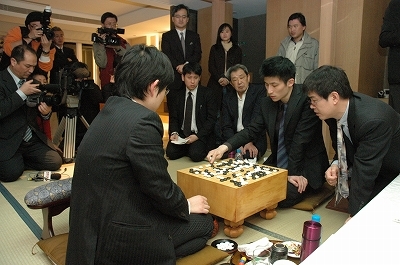 Cho U, challenger in this year’s Kisei title match, won game one against title holder Yamashita Keigo. In their most recent encounter, Yamashita captured the Tengen title from Cho U last month. The record of game one is here. Cho U, playing white, won by resignation. The tournament table is here. Game two will be played on January 27 and 28. This entry was posted on Friday, January 15th, 2010 at 8:04 pm	and is filed under Uncategorized. You can follow any responses to this entry through the RSS 2.0 feed. Both comments and pings are currently closed. why black let himself in a ko fight and not simply defend it? was black very much behind at that position? It seems to me that black does not have a way to “simply defend”, but has to play the ko. What do you have in mind in order for black to avoid the ko?